An excess of mucosa overlying one or more structures in the larynx above the vocal cords. Mucosa in this area should “fit” snugly, like leggings, but in the case of redundant supraglottic mucosa, the fit becomes more like baggy pants. This redundant supraglottic mucosa most commonly develops on the apex and posterior surface of the arytenoid cartilage. Such mucosa sometimes draws inward during breathing and fills the laryngeal vestibule. In a severe case, inspiration can become noisy (stridor) or even effortful. When symptoms like these become troublesome, the excess mucosal tissue can be removed with endoscopic laser surgery. Redundant supraglottic mucosa is similar to the disorder laryngomalacia. 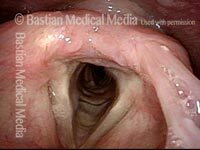 In both disorders, supraglottic tissue is pulled into the laryngeal vestibule during breathing and can cause stridor. However, the causes of these symptoms are different. 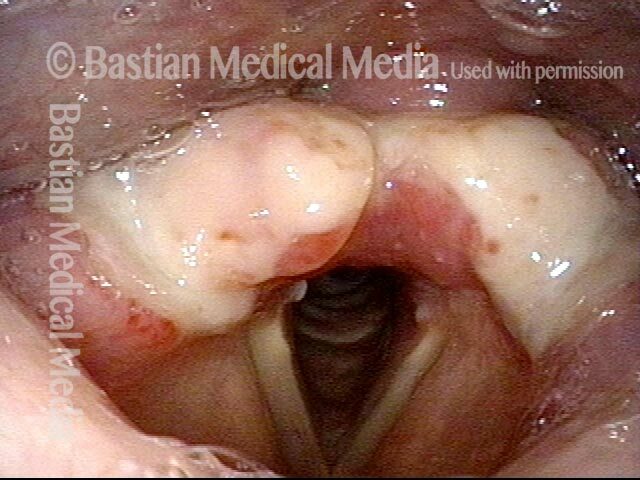 In the case of redundant supraglottic mucosa, the main problem is an excess of overlying mucosa, but in the case of laryngomalacia, the main problem is that the underlying structural tissue, such as that which comprises the aryepiglottic cord and epiglottic cartilage, is abnormally weak or soft. Same patient, one week after laser peeling of the redundant mucosa. The areas which were addressed include: the upper face of the arytenoid, apical mucosa, aryepiglottic mucosa adjacent to the arytenoid, mucosa from the postarytenoid surface, and even some postcricoid mucosa. At the peak of rapid inspiration. The aryepiglottic cords are drawn in slightly, but the laryngeal vestibule remains widely open. Compare with photo 3. Closer view of surgical details, showing that the entire posterior surface of the arytenoids has been denuded. 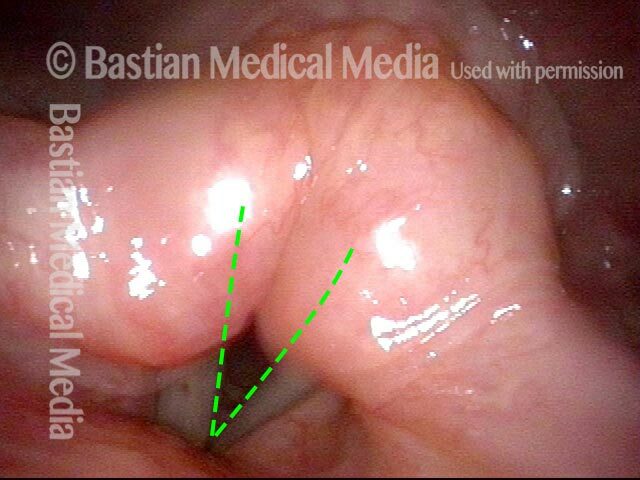 An asterisk marks the edema at the cut edge of the postcricoid mucosa. Same patient, now seven weeks since laser peeling of the redundant mucosa. 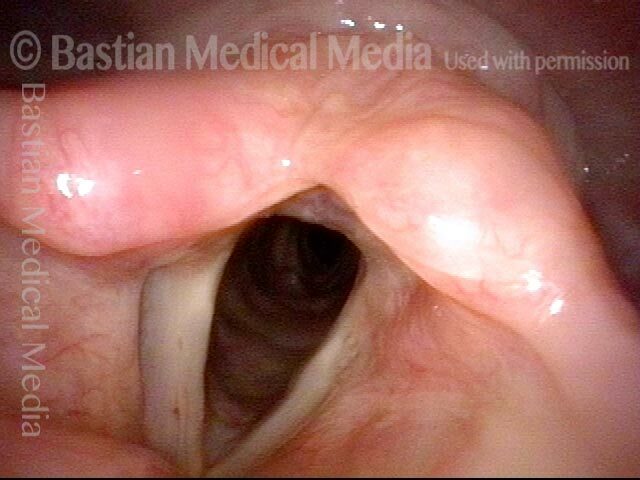 As the patient rapidly inspires here, the laryngeal vestibule remains widely open. The patient says that she no longer feels a sense of obstruction or hears noise when breathing, even with her chin down. Compare with photos 2 and 3. The areas that were operated on have healed. Compare with photo 6. This patient said that, when she breathes in (inspires), she hears noise and feels a sense of obstruction, especially if she inspires rapidly or with her chin down. She had found it necessary to use CPAP while reading with chin down, for example. Here, the patient is breathing quietly, with chin in neutral position, “looking at the horizon.” The vocal cords are abducted, the laryngeal vestibule is open, and there is no breathing noise. Upon request, with her head position unchanged, the patient begins to inspire rapidly. As she inspires, supraglottic tissue (of the arytenoids and aryepiglottic cords) is drawn into the laryngeal vestibule, and harsh breathing noise is heard. This indrawn tissue, which is redundant mucosa, partially obscures the view of the still-abducted vocal cords (dotted lines). At the peak of rapid inspiration. The vocal cords are still fully abducted (dotted lines) but almost completely obscured by the indrawn mucosa. In addition to the rushing sound, there is also a low-pitched fluttering or rumbling sound, caused by vibration of the leading edge of the indrawn supraglottic mucosa. 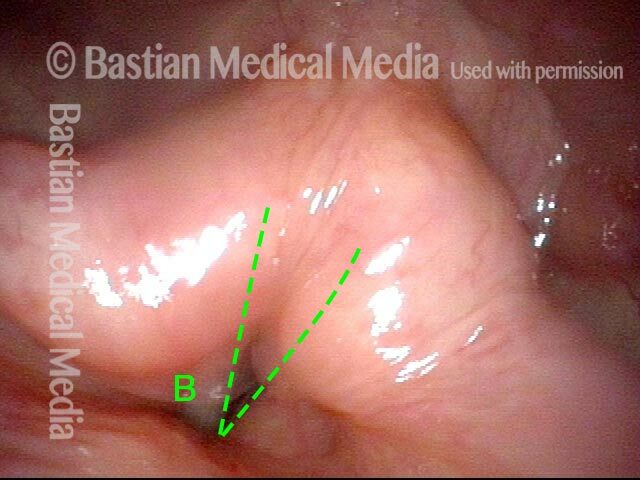 “B” marks this blurred, vibrating mucosal margin.